Trigger points, or a type of muscle stiffness commonly referred to as “knots”, are the result of tiny contraction knots that develop in muscle and tissue when an area of the body is injured or overworked. 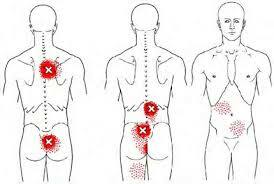 A hallmark of a trigger point is something called “referred” pain. This means that trigger points typically send their pain to some other place in the body, which is why conventional treatments for the area where the pain is felt may be not effective. Trigger points can occur as a result of muscle trauma (from sports and work related injuries, falls and car accidents), muscle strain from repetitive movements at work or at play, postural strain from standing or sitting improperly for long periods of time (for example, at the computer or texting neck), emotional stress, anxiety, allergies, nutritional deficiencies, or part of the inflammatory response and toxins in the environment. A single event can initiate a trigger point, and you can suffer the effects for the rest of your life if that trigger point is not addressed properly. 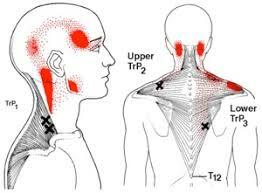 A Trigger point itself causes pain and discomfort. Your body’s instinctive reaction to pain or a harmful event is to protect itself. It does that by altering the way you move, sit or stand, which puts abnormal stress on your muscles, tendons, ligaments and joints. This produces strength and flexibility imbalances in your muscles, as well as postural dysfunctions throughout your body. If left unchecked, your body’s nervous system will start to filter the pain causing you to feel more comfortable in these new awkward positions. Over time, muscles and tendons will shorten and your body will develop chronic muscular conditions that take much longer to resolve or improve. The key is to get ahead so that neuro adaptation does not cause you to have dysfunctional postural positions. To better illustrate the process; here is an example of how one trigger point in one muscle can cause back pain, sciatica, or a herniated disc. The most common place for a trigger point is in the muscle of the lower back called the quadratus lumborum (QL), which is a broad muscle located just above your hips on each side of your spine. Regardless of what kind of event sparks the trigger point, a trigger point in your QL can gradually cause your movements and posture to become dysfunctional – that is , the QL on the affected side can tighten and shorten and cause further compensation and effects on your posture. And as you limit its use it can also weaken. 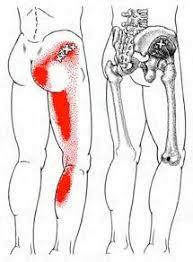 As the QL becomes increasingly dysfunctional, it will alter the position of the pelvis and ribs and spine. As the pelvis becomes dysfunctional, it will force the spine into an abnormal curvature that will put abnormal pressure on the disc between the vertebrae. Over time the disc can begin to bulge. This situation can get progressively worse, affecting your overall quality of life. 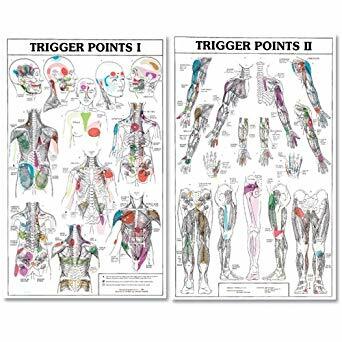 DO YOU HAVE TRIGGER POINTS? Everyone has trigger points, the question is the degree. If you have lingering pain, tightness, or restriction of certain movement, it is a good bet that you are experiencing the effects of a trigger point. Trigger points may produce symptoms as diverse as dizziness, earaches, sinusitis, nausea, heartburn, false heart pain, and/or numbness in the hands and feet. Trigger points can bring on headaches, neck and jaw pain, lower back pain, sciatica, tennis elbow, carpal tunnel syndrome – you name it. They can be the source of joint pain in the shoulder, wrist, hip, knee, and ankle that is often mistaken for arthritis, tendon pain, bursitis or ligament injury in some cases. In cases where the pain is referring to your jaw or left arm, it is a good idea to get other more serious conditions ruled out before seeking care. Trigger point therapy involves treatment via Active Release Technique, Hawkgrips Therapy and Therapeutic Ultrasound. Getting care on a regular basis can help prevent reoccurrence of trigger points and most importantly it can relieve pain. As treatment is applied the Trigger Point releases allowing the release of tension, improved blood flow and improved flexibility in the area. The result of care is more flexibility, less pain and better over all motion throughout the body. Regular care can allow patients to experience improved sleep, less stress, better workouts, and most importantly overall motivation to have an active lifestyle without pain. Dr. Derek Gearhart is a highly educated sports medicine chiropractor with over 10 years’ experience assessing movement patterns and identifying and treating injuries in athletes and active individuals. His certifications are used at the highest level of evaluation and soft tissue treatment in sports medicine. He is the primary doctor at Bucks Sports Chiropractic and an anatomy and physiology adjunct faculty member for the Science Technology Engineering and Math program at Bucks County Community College.